A near total bandh by traders, in protest against the recent amendment in the East Punjab Rent Restriction Act, 1949, paralysed business activity in the city during the day. By the evening only the main shopping centres remained closed, while a few shopkeepers, in the other markets, opened their establishments. Eight persons were injured, four of them seriously, in a clash between two groups in Lohgarh village near here late yesterday. Sticks, batons, sharp-edged weapons and even a double-barrel gun were used in the clash. The proposal to extend the municipal limits of Pinjore to scattered pockets is likely to benefit hundreds of violators of the Punjab New Capital Periphery Control and Regulation Act, including influential farmhouse-owners, real-estate agents and the hotel-resort lobby. The security of the Burail jail will be handed over to the Central Reserve Police Force. A company of the paramilitary force will replace the Special Security Bureau, presently manning the high-security jail. Afghanistani delegation here today expressed disagreement with the reported US suggestion to India to slow down the reconstruction of the war-ravaged country apparently to keep Pakistan in good humour. The National Sample Survey Organisation, for the first time after Independence, will undertake a year-long situation assessment survey from January 1, 2003 to evaluate policy impact on farmers and suggest correctional measures. The survey is being conducted on the request of the Union Ministry of Agriculture to look into the impact of doles to farmers, their falling returns, low productivity and to make them internationally competitive. A Sector 44 resident, Georgina Roy, here yesterday walked away with 17 prizes in the individual category of the Chrysanthemum Show-2002 followed by the PGI with 10 prizes, Haryana and Punjab Accountant-Generals five each, Punjab Warehousing Corporation four and Hotel Mountview three. “Chandigarh has really impressed me and I found it to be a well-planned city”. These were the views expressed by Ms Tan Hangping, Deputy Secretary-General of the Chinese People’s Association for Friendship with Foreign Countries at the guest house of the Punjab School Education Board here. The Income Tax Commissioner (Appeals-2), Ludhiana, Mr M.L. Dhunsa, who was arrested yesterday by the CBI in a case of corruption, was today remanded in two-day police custody by a CBI Special Judicial Magistrate. Deputy Commissioner M. Ramsekhar here today sent a formal communication to the Secretary of the Municipal Corporation to hold annual elections of the Mayor, Senior Deputy Mayor and Deputy Mayor on January 1. The last date of the filing of nominations is December 28. The by-election to fill the vacancy of a Zila Parishad member from Kishangarh and Mauli Jagran will be held on January 5. The last date for filing nomination papers is December 24, scrutiny will be on December 26 and withdrawal of candidature on December 28. Harbhajan Singh Halwarvi, Editor, Punjabi Tribune, who has been nominated a member of the General Council of the Sahitya Akademi, New Delhi, for five years. He is a prominent Punjabi journalist and a well-known poet and writer, who has four books of poetry and three travelogues to his credit. He has been honoured with Shiromani Punjabi Patarkar and other awards. During the past 24 hours the police has registered four cases of theft from different parts of the city. A resident of Sector 45, Mr Ajay Kumar, reported with the police that someone has stolen gold jewellery and Rs 3,000 from his residence yesterday. A colour television and Rs 3,000 has been reportedly stolen from residence of Mr Harbhajan Singh, a resident of Ram Darbar, here yesterday. The Dhillon group swept the Punjab School Education Board Employees Association elections held here today. 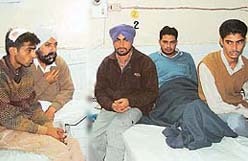 While Gurdeep Singh Dhillon was elected president of the association, Bhagwant Singh Bedi was chosen its general secretary. A section of UT cadre lecturers, employed in government arts and science colleges, submitted a memorandum to the UT Administrator regarding the ongoing row of seniority in these colleges. Christmas spirit prevailed in Mount Carmel School, Sector 47, here today. Carol singers from several schools in the city converged at the school, which hosted a Christmas school concert. A section of the Punjab and Haryana High Court advocates today claimed that three High Court Judges, accused of committing the same offence, had been treated differently and issued an appeal to the High Court Bar Association to convene a meeting for discussing the relevant issues. Mr Roshan Lal Chouhan, Judicial Magistrate, today remanded Naresh Kumar, J.E. of the Punjab State Electricity Board, who was arrested by the Vigilance Bureau on the charge of accepting bribe, in police custody till December 20. Chandigarh has a new film academy opening almost every year. Never mind the fact that the performance of none of the existing academies has been satisfactory. Even as many young enthusiasts, who enrolled with some such academies are still struggling to put their house in order, yet another institute opened in Sector 35 this morning. Several residents, suspecting themselves to be suffering from leprosy, voluntarily reported in about 29 health centres in the city functioning as specialised centres for diagnosing and treating leprosy cases. 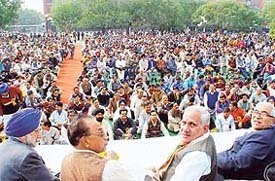 The annual sports meet of St Xavier’s High School was organised in Sector 71 here today, where Mr Jagmohan Singh Kang, Punjab Minister of Sports and Youth Services, Animal Husbandry, Dairy Development and Fisheries, was the chief guest. The minister inspected the march past by students of four houses of the school that was led by the sports captain.